This powerful collection of Yusef Komunyakaa's poetry delves, with his characteristic allusiveness, intelligence, and intensity, into an age of war and conflict, both global and internal, racial and sexual. "Sweetheart, was I talking war in my sleep / again?" he asks, and the question is hardly moot: "Sometimes I hold you like Achilles' / shield," and indeed all relationships, in this telling, are sites of violence and battle. His line is longer and looser than in Taboo or Talking Dirty to the Gods, and in long poems like "Autobiography of My Alter Ego" he sounds almost breathless, an exhausted but desperate prophet. With the leaps and improvisational flourishes of a jazz soloist, Komunyakaa imagines "the old masters of Shock & Awe" daydreaming of "lovely Penelope / like a trophy." 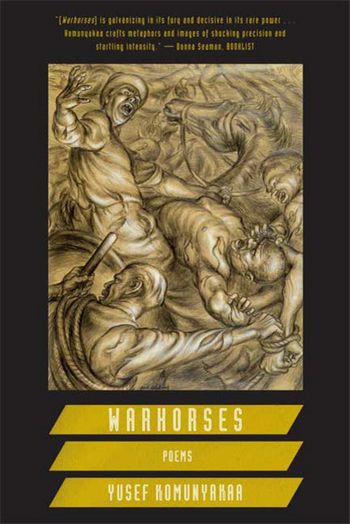 Warhorses is the stunning work of a Pulitzer Prize-winning poet who never ceases to challenge and delight his readers. Yusef Komunyakaa's twelve books of poems include Taboo (FSG, 2004) and Neon Vernacular: New and Selected Poems, for which he received the Pulitzer Prize. He teaches at Princeton University.